I was going to upload this based on the lone fact that it’s a girl with a couple of hot looking guns, then I notice the ammo magazines, and how they’re…funky. Anyone know what the story is on these? Why are they going in at a 90 degree angle? Those look like magazine carriers. They are used when the gun must be unloaded. They snap into the gun and then you snap the magazine into the carrier. The writing on the sign over her head and on her shirt is in Hebrew if that helps. The second word is hard for me to make out and looks like chet-samech-chet-kaf-yod-mem. So, I can safely assume it’s a plural noun but I cannot find any nouns starting with chet-samech-chet… So… I’m not sure what the second word is. Sorry I couldn’t help. 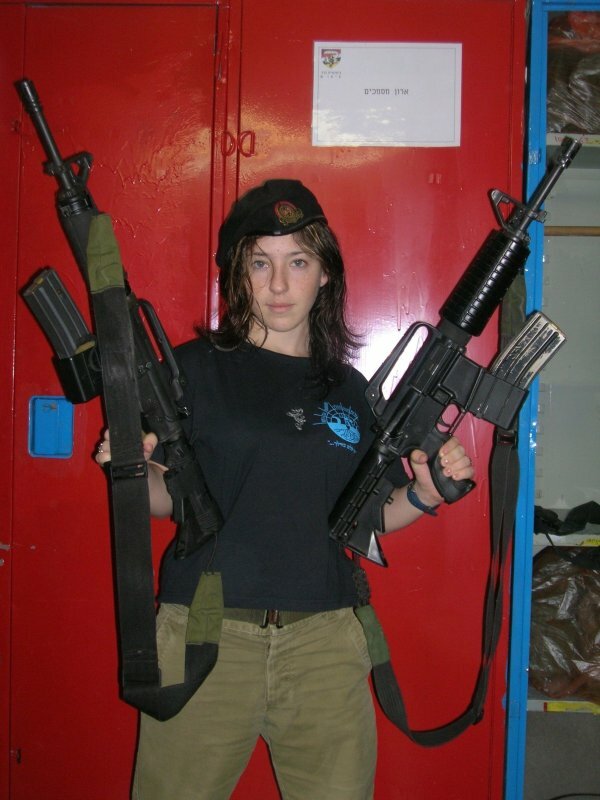 So, I’m guessing that she’s in the IDF perhaps? the magazines are like that so that when the one mag is empty, she can just release it and rotate it and load the other one. I’m a soldier in IDF, the girl holdes up to short M16 Rifles with safe-clips, it is a clip inserted into a plastic clip which is stuck in the rifle. When you need to shot, u jsut pull it out, rotate it and plug it in. Unfortunatly I can’t see what Unit she is, but those are probably fight force because she has a red background behind the symbol on her berete. For the record she is holding M4s not M16s, but good job calling them a M16 when you are in the military. “The M4 Carbine is a family of firearms tracing its lineage back to earlier carbine versions of the M16, all based on the original AR-15 made by ArmaLite. Either that or i think the rifles have erections.